"Extra gooey brownies! I found this recipe online and tweaked it to my liking. I've never been able to make gooey brownies, but these come out amazingly gooey and nothing like dry cake-like brownies!" Preheat the oven to 350 degrees F (175 degrees C). Line a 2.2-quart glass baking pan with aluminum foil and spray with nonstick cooking spray. Combine sugar, butter, and vanilla extract in a bowl. Beat with an electric mixer until smooth and fluffy. Sift 3/4 cup flour, cocoa powder, salt, and baking soda together in a second bowl. Beat eggs, one at a time, into the sugar and butter mixture, until thoroughly combined. Add the flour mixture in 2 to 3 batches, mixing slowly until batter is just combined. Toss chocolate chips and walnuts with 1 1/2 tablespoons flour. Fold into the batter. Pour batter into the prepared baking pan and use a rubber spatula to level off the top. Bake in the preheated oven until edges are set and start to pull away from the sides of the pan, 20 to 30 minutes. Let cool until center firms up. 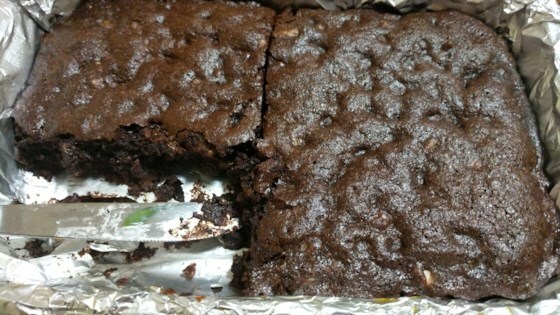 A toothpick inserted into the brownies should never come out completely clean since these are to be gooey. They will set up cooling. If they do not set, you may have to bake for another 10 minutes or so.